Nothing says class and culinary prowess like a flavorful steak dinner! And if you think that such a feat can only be pulled off by a professional, you are extremely wrong! Nowadays, even average housewives and occasional chefs can cook up a tasty, elegant steak dinner for their loved ones. With the right meat cuts, temperature, cooking time, side ingredients and plating techniques, you can make your steak look like those served at high-class restaurants. In today’s post, we bring you our white truffle oil recipes steak edition! With dishes that will make you look like a regular Gordon Ramsay minus the colorful language (or with even more colorful language, we’re not judging!). While these truffle oil steak recipes may look intimidating, don’t worry! They’re relatively easy to follow and won’t require you to slave over the kitchen or grill for hours on end. 2 large New York strip steaks, roughly 12-16 ounces each. 1. Combine the butter and miso in a bowl. Mash together until the miso is smooth. You can use a food processor for a finer, creamier consistency. 2. Once smooth, add the white truffle oil. You can start with 1 teaspoon, taste and add more if you want. 3. Take the 2 pieces of strip steaks and season generously with pepper and and a bit of salt. Allow the steak to stand at room temperature at least an hour before grilling. 4. If you want, you can refrigerate the seasoned steak for a maximum of 48 hours. Just make sure to thaw it to room temperature prior to grilling. 5. If you are using a charcoal grill, place coal on only one side. If you’re using a gas grill, only turn on the burners on one side. One side should be functioning, while the other side should be as cool as possible. 6. Start grilling the steak on the hot side of the grill. Rotate the steak every now and then so you get a nice crust on all sides. Grill one side for 4-5 minutes before flipping the steak and grilling the other side. 7. One both sides are grilled according to your preference, place the steak on the cool side of the grill. Cover the steak and allow it to cook slowly from the indirect heat. For medium-rare steaks, this step should take up to 10 minutes. 8. Set aside for 5-7 minutes to cool slightly before slicing the steaks in half. 9. Place each piece on a serving dish and spoon some of the butter miso mixture on top before serving. This recipe yields 4 servings of steak. You can make the miso butter in advance. The mixture lasts up to one week when refrigerated properly. 1. With a brush, thoroughly coat the steaks evenly with olive oil. 2. If you’re using a gas grill, turn off half of the burners so you have one side that provides direct heat, with the other providing indirect heat. 3. Sear the steaks for one minute over direct heat. After 1-2 minutes, flip them to the other side and sear until both sides are grilled according to your liking. 4. In a skillet, start melting the butter. 5. Once the butter has melted, add the onions, garlic, rosemary and mushrooms. Cook over medium high heat for 10 minutes or until the mushrooms are a golden brown color. 6. Remove skillet from heat. Season with salt, pepper and truffle oil according to your preference. 7. 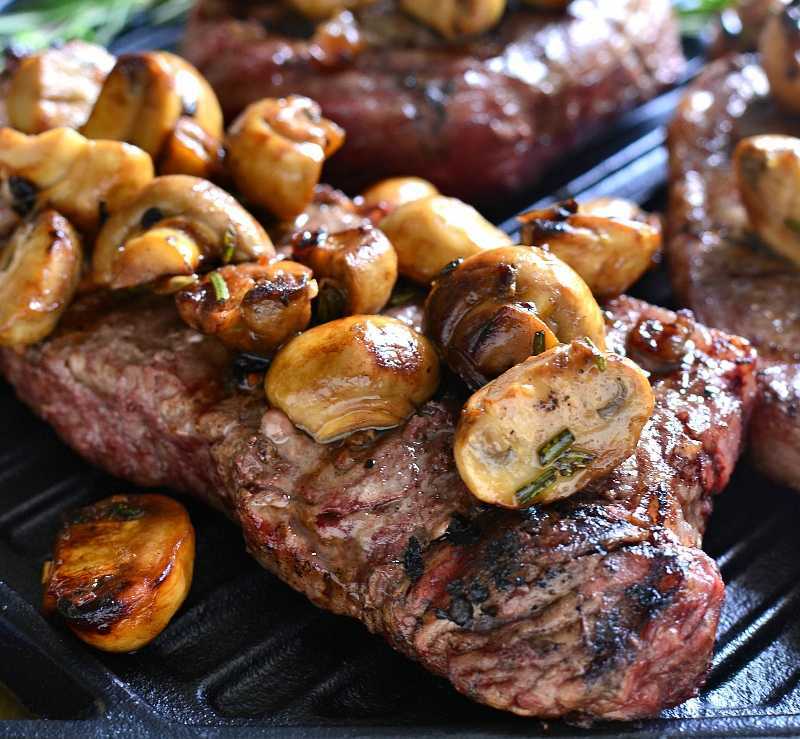 Transfer the steaks to a serving platter and top with the cooked mushrooms. This recipe yields 6 servings. For an added twist, you can wrap the steaks in bacon before grilling. 1. In a bowl, combine the olive oil, vinegar, garlic, horseradish, shallots, basil, black pepper and truffle oil. Mix to combine all ingredients. Soak the steaks in the marinade, making sure the entire steak is covered with the sauce. 2. Keep refrigerated for 24 hours. 3. Allow the steaks to thaw before grilling them. Sear the steaks on a grill. Adjust fire to provide low heat. 4. Slowly grill the steaks, turning them over occasionally and re-coating them with marinade using a brush. 5. Serve the steaks on a platter, and top with its marinade juices. Drizzle truffle oil on steak before serving. The marinade included in the recipe is good enough for 4-6 steaks, depending on the cut and slice. 1. Preheat your gas grill to high. 2. Season your french fries liberally with salt and bake them, following the instructions on the package. 3. While your fries are in the oven, start seasoning your steaks. Apply olive oil on all sides of the steak and rub it in. 4. Sprinkles salt and black pepper on the steak liberally. 5. Start grilling your steak on your grill of choice, searing each side for around 3-5 minutes, depending on your steak’s cut and thickness. 6. After 3-5 minutes, flip the steak and start searing the other side. 7. Once the steaks are done on both sides, transfer it to a plate. Wrap the steak in aluminum foil and set aside while you work on your fries. 8. Remove the fries from the oven and transfer to a platter. Drizzle truffle oil and parmesan cheese on top. You may also garnish the french fries with chopped rosemary. 9. Unwrap the steaks and serve together with the fries. This recipe yields 2 servings. 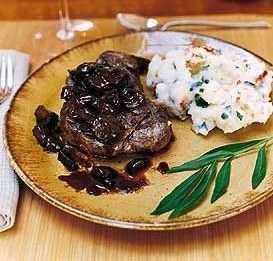 This truffle oil steak recipe is best served together with a glass of red wine. 1. If you are using dried mushrooms, instead of fresh ones, rehydrate them first. Clean the dried mushrooms using running water, removing dirt and grit. Transfer the mushrooms to a bowl. Pour warm water, making sure to soak the mushrooms fully. 2. Allow the mushrooms to rehydrate for 30 minutes, then chop them coarsely. If the soaking water is clean and free from dirt, you may still use it later for the sauce. 3. In a heavy saucepan, heat ¼ cup of the butter and olive oil. Stir until the butter has melted and the two ingredients are well-combined. 4. Season the fatty pork with a bit of salt and pepper. Fry the pork in the butter/olive oil mixture for around 20 minutes, or until the lean parts of the meat have turned brown. 5. Add garlic, bay leaves and onions. Season with salt and pepper. Cook for 10 minutes, or until the garlic turns fragrant. 6. Add the rest of the butter, assorted mushrooms, pine nuts, rosemary and thyme. Stir occasionally and cook for another 10 minutes, or until the mushroom is somewhat wilted. 7. Stir in worcestershire sauce, balsamic vinegar, mushroom soaking water, red pepper, wine and honey. Allow the sauce to boil. 8. Once boiling, turn down heat and allow the sauce to simmer for around 10 more minutes, or until the volume of the liquid has been reduced. Remember to stir occasionally to incorporate the different flavors of the ingredients. 9. Remove from heat. Drizzle truffle oil and stir gently to combine it with the other ingredients. Taste sauce, and add more seasoning if necessary. 10. Pour ragout into a jelly roll pan. Set aside for thirty minutes to cool. 11. Preheat the oven to 325 degrees F.
12. Place the venison roast on a flat, even surface. With a thin, sharp knife, start cutting into the roast without cutting all the way through. The cuts should be around half an inch in thickness, just to open up the roast for more even cooking. 13. Liberally season the venison with salt and pepper. Pour the ragout over the roast. 14. Start rolling the venison roast, making sure that the ragout doesn’t seep out from the inside. If ragout escapes and leaks out, just add more ragout using a spoon. 15. Once the venison is all rolled, secure it using cooking twine. 16. Brush olive oil over the surface of the roast. You may also season it with more salt and pepper if you wish. 17. In a roasting pan, heat olive oil. Brown the roast over medium heat, occasionally moving it and adjusting it so it cooks on all sides evenly. Turn the roast carefully so the ragout doesn’t leak out. 18. Transfer the roast onto a roasting rack that’s placed on shallow pan. Place bacon strips on top of the roast. 19. Place the roast inside the oven and bake for one hour and 30 minutes, or until the oven’s temperature reaches 140°F. Occasionally check on the roast and baste it with the juices that seep out onto the pan. 20. Remove the roast from the oven and set it aside to cool for around 15 minutes before you start carving it. 21. Remove the bacon and finely chop it. Set aside for later use. 22. Carefully cut the cooking twin and start slicing it crosswise. Remove any curdled bits of fat on the sides of the pan, and spoon more juices on top of the roast. 23. Finely chop some parsley and sprinkle on top of the roast. Add lemon zest and bacon bits before serving. This recipe yields 8 servings. If you have any leftover ragout, you can use it as a nice sauce or stew that goes well with any dish. Just reheat the ragout and add stock. 1. Trim the meat with a boning knife, removing all silver skin and fat from the meat. Drizzle some truffle oil all over the meat, rubbing it into the meat for better absorption of flavors. 2. Season meat with salt and pepper. Set aside for 30-60 minutes before transferring the meat to the grill. 3. Place the bacon slices on a grill set to high heat. Cook the bacon strips quickly, allowing it to brown, but removing it from heat before it starts to wrinkle. Lay the cooked bacon strips on a plate filled with paper towels. Set aside, allowing the bacon strips to cool while removing excess oil. 4. Once the bacon has cooled, wrap it around the filet mignon. Secure the bacon using a cooking string. 5. Preheat the oven to 200°F. Place a large platter inside the oven to heat. 6. Go back to your grill and reduce the heat to medium high. Place the bacon-wrapped filet mignon on the grill. Let it sear for 2-3 minutes before turning it over with a tong to grill the other side for another 2-3 minutes. 7. To check whether or not the steaks are done, make a small cut at the center. If you want your steaks rare, remove the steaks from heat once the center is a deep red color. If you like medium rare steaks, remove the steaks once the center has a nice pink color. 8. Using a tong, place your steaks on the platter you preheated inside the oven. Cover the steaks with aluminum foil loosely and allow to stand for around 5 minutes. 9. Cut and discard the kitchen string. Transfer the steaks to a serving dish and drizzle more truffle oil over it before serving. This recipe yields 4 servings. Wrapping bacon around grilled lean meats is a common French technique in cooking called barding. 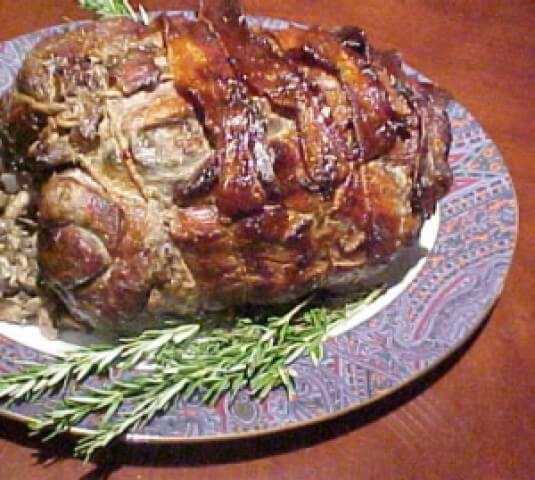 Bacon gives any lean meat more flavor and moisture, especially when used together with truffle oil. 1. Combine the garlic, salt, parsley in a bowl, creating a paste. Rub it against one side of the steak. Drizzle some olive oil on top and season with pepper and lemon juice. 2. Heat your grill to high, and lay the steaks down on the grill at a 90 degree angle for those nice diagonal grill marks. Sear for 4-6 minutes before turning it over to the other side and searing that side for another 4-6 minutes. 3. Transfer the steaks to a plate and allow to cool for 10 minutes. 4. Start slicing the steaks at an angle. Remember to slice against the grain. 5. Place some baby arugula on a serving platter. 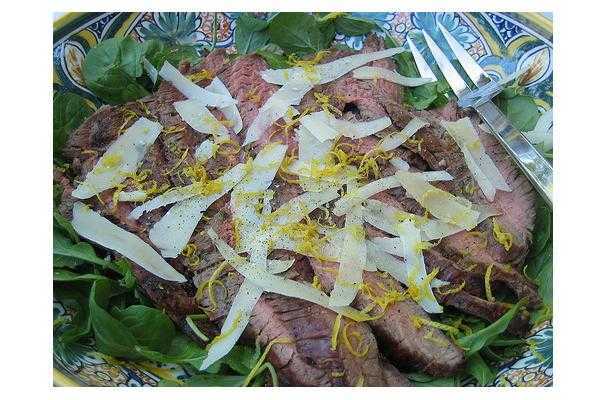 Place the steak slices on top of the arugula. 6. Garnish with some grated cheese, lemon zest and more truffle oil. 7. Taste and adjust seasonings to your taste before serving. 1. Rub salt and pepper on the sirloin steak. Set aside. 2. Prepare the vegetables by removing the tails, tops and cores. Chop and cut the different vegetables into bite-sized portions. 3. Combine the red onion, peppers, courgette, aubergine and mushrooms in a large bowl. Drizzle some olive oil on top. 4. Remove the rack from your grill and replace with a frying pan. Transfer the vegetables on the pan and season with a bit of salt and pepper. Grill the vegetables for around 20 minutes, tossing occasionally for even cooking. 5. Once the frying pan is really hot, add the steak and cook, flipping every 15 seconds to evenly cook all sides. Remove from the pan and place on a plate. Cover the steak with aluminum foil and set aside. 6. In a small bowl, combine the balsamic vinegar, olive oil, lemon juice and mustard. Mix until combined. 7. Once the vegetables are done, transfer to a serving platter. Pour dressing on top. 9. Drizzle truffle oil on top before serving. 1. Lay the steak out on a flat surface and tie it up using a kitchen string. If the steak is frozen, leave it to thaw first before you start this recipe. 2. Clean the vegetables under running water to remove dirt and grime. Place the green beans and broccoli in a pan without shaking off the excess water. Add salt and butter. 3. Cover and cook vegetables over medium heat. 4. Wash the vegetables and place in a pan without shaking off the water – it will help them cook with no extra liquid. Add a knob of butter and some salt, cover the pan and put on medium heat. 5. Preheat a large skillet. Rub salt, pepper and olive oil on your steak. 6. Once the skillet is smoking, place your steak on it. For a regular, medium-rare steak, sear each side for 4 to 5 minutes. 7. Remove from heat once the steak is cooked. set aside on a platter, covered with aluminum foil. 8. Turn your attention back to your vegetables. By now, the vegetables should be tender. Add the blue cheese and continue cooking, stirring continuously, until the cheese melts. 9. Remove the aluminum foil from the steak and untie the kitchen string. You can slice the steak into strips if you wish. 10. Place the vegetables on the same platter. Drizzle truffle oil on top before serving. 1. In a deep fryer, heat vegetable oil. 2. Chop the fennel bulb lengthwise to create thick chips and place in a large bowl. Add thyme, flour, lemon zest. Season with a bit of salt and pepper. 3. Toss ingredients together. Beat 1 whole egg and add it to the bowl. Mix until a batter forms. Set aside. 4. Go back to your deep fryer. Cook the spinach leaves until crispy. This shouldn’t take more than a few seconds. Remove spinach leaves, tapping the excess oil off, and set them on a paper towel to drain the rest of the oil. 5. In the same pan, cook the fennel for 5-8 minutes, or until the batter surrounding the fennel is golden and crispy. Remove from heat and lay the fennel on kitchen paper towels to drain the oil. Place the fennel on a baking tray and keep inside the oven set to extremely low heat. The goal is not to bake the fennel, but to keep it warm. 6. Heat the griddle until hot and smoking. 7. Rub salt, pepper and olive oil all over the beef. Sear the beef on the griddle for around 3 minutes before flipping it to the other side and grilling that side for 3 more minutes. 8. Remove from griddle, and set steaks aside for around 6 minutes. 9. In a saute pan, heat the butter until it begins to bubble. Cook thyme and shallows for a minute. 10. Add mushrooms and prawns. Cook for another 3 minutes. Taste and season dish according to your preference. Remove from heat and set aside. 11. 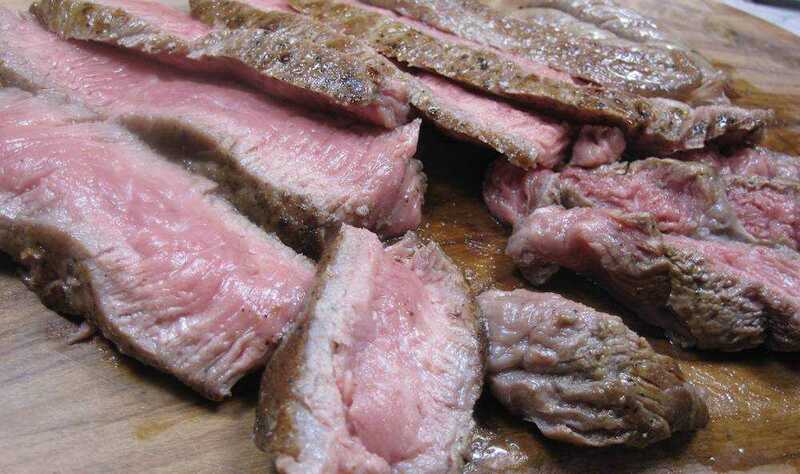 Cut the steak into strips and place in a serving dish. Spoon some of the mushroom and prawn sauce on top. Garnish the dish with a bit of truffle oil and the crispy spinach. 12. Serve steak along with the crispy fennel fries. 1. Wrap the steak in cling film and use tenderizer to hammer them out to around twice their original size. 2. Peel potatoes and cut into oblongs. Blanch potatoes in a pot of salted water until boiling for around 4 minutes. 3. Drain potatoes. Heat olive oil in a fryer and cook potatoes until crispy. 4. In a pan, heat butter until melted. Chop garlic and shallot, and add them to the pan. 5. Add button mushrooms, beef stock and brandy. Allow the sauce to simmer until its volume is reduced by ¾. 6. Add double cream, chopped parsley and Dijon mustard. 7. In a bowl, whisk the egg yolk. Add truffle oil, lemon juice and parsley slowly while whisking. Season with a bit of salt and pepper. 8. Grill the steak according to your preferences. You can cut into the steak to determine whether it’s cooked. For rare steak, go for a deep red color at the center. For medium rare, a nice pink color at the center is your indicator. 9. Place the watercress on a large serving plate. Pour the truffle oil dressing on top. 10. Place steak over the watercress and dressing, and pour the sauce around the steak. 11. Serve together with crispy potatoes. 1. In a skillet, heat butter over medium heat until fully melted. Add the mushrooms and mix to fully coat it with butter. Season with salt. 2. Cover the skillet and allow the mushrooms to cook for 13 minutes or until they release their juices. 3. Add wine, whipping cream and chicken broth. Allow the sauce to boil for around 5 minutes, or until the mushrooms become tender. Season with a bit of salt and pepper according to your preference. Cover the skillet and set aside. 4. In another skillet, heat peanut oil over high heat until melted. 5. Rub salt and pepper on all sides with salt and pepper. Place on the skillet and cook according to your preference (4 minutes for each side if you want it medium-rare). 6. Place the cooked steaks on a serving platter. Spoon the ragout mixture on top of the steak and all around it. 7. Drizzle truffle oil and mushrooms on top before serving. 3 marrow bones around 5 centimeters in length each. 1. Roast the marrow bones for 20 minutes at 350°F. 2. In a frying pan, heat the olive oil. Add thyme and butter, and heat until the butter is completely melted. Add the beef fillet and cook for a few minutes until it fully absorbs the flavour of the other ingredients. 3. Remove from heat and transfer beef fillet to a baking pan. Place inside oven set to 400°F. Cook for 6-10 minutes. Discard fat drippings on the pan, but leave the pan as is. 4. In a saucepan, boil potatoes in water until they become soft. 5. Take the bone marrow and scoop out its insides. Set aside the bones. 6. Remove potatoes from heat and transfer to a bowl. Mash the potatoes. 7. Once potatoes are smooth and free of noticeable lumps, add the marrow, white truffle oil, cheese and black truffle. Mix until combined. 8. Take the bones and spoon the potato mash into the marrow. Place bones on a baking tray and cook in the oven for around 5 minutes. 9. Remove beef fillets from the oven and set aside for around 10 minutes before slicing into thin strips. 10. In the same pan used to fry the beef fillet, heat beef stock and balsamic vinegar until hot. 11. On a serving plate, arrange the bone marrow and beef side by side. Spoon some sauce over the two. 11. Garnish with a bit of chopped thyme, black truffle shavings (or truffle oil), and sea salt. This recipe yields 1 large serving. Steaks are such delicate things. If you get the cooking time, temperature and flavors right, you can get the best tasting, flavorful steak out there. However, mess up one and you can end up with a chewy, or tough, dry meal. Before you try out any of our truffle oil recipes steak tips are in order. Follow these and you’ll get the best results for less effort and money. Sirloin, ribeye and steak fillets are expensive. If they’re out of your budget, don’t worry! Just replace the steak used in the recipes to either flank skirt or flat iron steak. They cheaper, yet their mixture of fat and lean meat is just the right amount to bring the best flavor and fullness. Always grill or cook your steaks at room temperature if . If you store your steaks in the freezer beforehand, allow them to thaw before cooking. This ensures even cooking. Always season your steaks well with oil or butter, salt and pepper. Don’t just sprinkle the seasoning on top of the steak, make sure to rub the seasonings into the steak for better flavor retention. Always add the steak to an already hot grill. This caramelises the steak quite well and leaves those nice, standard grill marks. Flip the steak frequently when grilling. You can flip every 30 to 60 seconds per side, and just keep repeating this until your steak is cooked to your specifications. For more flavor, you can rub garlic or butter on the steak while you’re cooking it. 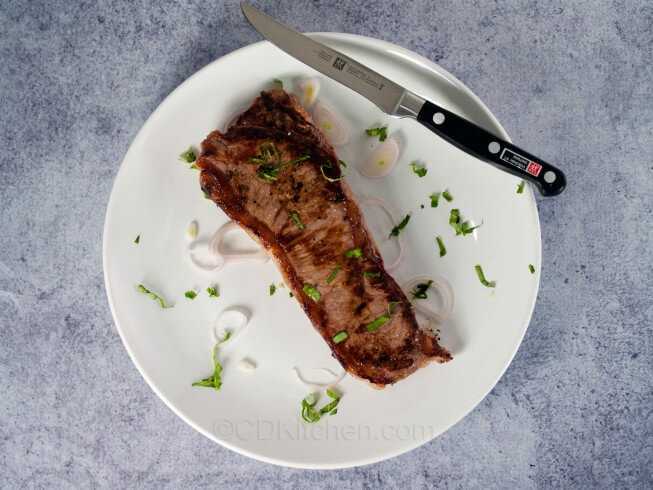 If the recipe calls for a marinade beforehand, brush the marinade repeatedly on the steak while cooking. Always set aside the steak after grilling, preferably surrounded by its own juices, in order to absorb more flavor. For better results, cover the steak with aluminum foil. Truffle oil is the magic ingredient here. Steak with truffle oil is worlds away from regular steak. Never use truffle oil in lieu of olive oil, as it loses its flavor when cooked. Always use truffle oil as a garnish before serving the steak dinner. A drizzle of truffle oil may seem like a small thing, but it makes a huge difference. So whether you’re preparing for an elegant family dinner, or a romantic dinner for two, steaks are the way to go if you’re out to impress. Steaks require just the right amount of skill and effort that speaks wonders about your culinary prowess to whoever tastes your dish. It tells them you’re not only good in the kitchen, but you also went through a lot of trouble to prepare such a tasty dinner. A great way to make other people feel special and important, if you ask me! However, of course you won’t tell them our little secret - that with a few tips, tricks and select ingredients, you can make professional-grade steak dishes without too much effort. The right steak searing techniques, quality meat cuts and an extra drizzle of steak truffle oil can go a long way.